"The music of EWW is inspired by and has its roots in Jazz and Global World Music. Using the didgeridoo, the primeval Australian wind instrument, the quartet seeks to express 'our history and longing for our ancient homeland'. The musicians do not provoke the break with tradition. They nurture the roots of jazz as well as those of world music folklore and European romanticism." "The four individuals fulfil Reks striving towards integration with captivating sovereignty. 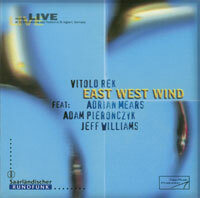 Contemporary jazz and vocal hints at unknown cultures fuse into an imposing depth of expression and East West Wind joins the ranks of renowned Fusion Ensembles."